In preparing our students broadly, we prepare them for the twists and turns that define most every life. That may be exactly how one Middlebury student found himself writing one. I believe he’s right. I’ve seen his work—it’s beautiful and inspired—and I’ve seen his passion for his field of study. I see how happy and rewarded he is as he satisfies the requirements of his major—all because he chose to take a chance and explore a subject away from his planned focus. This student’s story is one of dozens I’ve heard from current students. I’ve heard often about how before Middlebury, they believed their lives were on certain paths—a major, a career, a destination—and how a deviation from those paths took them into lives more surprising and more rewarding than they’d expected. It’s also a story I hear again and again from the Middlebury alumni I meet, and the lives I read about in these pages and so many others. Many of these lives bear little resemblance to the plans that existed at the start of college, or its end. A lawyer becomes an artist. An artist becomes a lawyer. An academic becomes an administrator. An apolitical person becomes an activist. A guidance counselor becomes a financial planner. A teacher becomes a novelist. A musician takes a chance to go live abroad, and a new career as a translator emerges. What allows for this kind of flexibility, resilience, openness to opportunity? In large part, I believe, it is the kind of liberal arts education offered at Middlebury. As our understanding of the world expands, that education expands, too. With participation from our students, as well as our faculty, we continue to examine and update our liberal arts curriculum to ensure that it is best preparing our students for the world that they’re living in. This includes broadening the curriculum to encourage and prompt students to diversify their interests and deepen their understanding of the world. In preparing our students broadly, we prepare them for the unexpected paths, the twists and turns (both sharp and gentle) that define most every life. Our response to those unexpected opportunities depends on what we know about ourselves and the world around us. 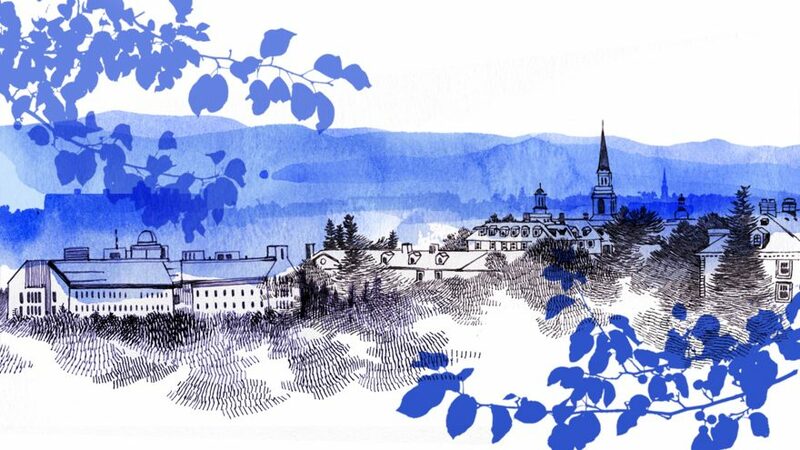 A Middlebury education does not make the path easy—it’s preparation for the tough path ahead. Sometimes it’s a matter of choice. You choose a major after finding a course, or a professor, that delights you, and you find you keep going back for more. You choose to study abroad in another language, not your first, and in an unexpected region—Yaoundé, Cameroon, rather than Poitiers, France; or Montevideo, Uruguay, rather than Madrid, Spain. Other times, it’s a lack of choice—a class you have to take because the course you want is closed. The room, or roommate, you have to choose because your plans fell apart. The job you accept after you’re turned down for the one you want. Often, it’s about the work you think and feel you are ready for, rather than the position or title or even identity that you might be taking on. When people ask me, “How did a scholar of early Indian history and culture become an educational leader?” I respond that, at every moment of decision in my career, I asked myself what kind of work I could do that would be the most service to the world. Then I knew I was authentically responding to the opportunities the world was offering, rather than simply fulfilling a role or holding a title. I’ve turned down leadership roles because, even though the role might have been attractive, I knew someone else would be better for the job, and I wouldn’t be authentically responding to an opportunity for service. Viewed in that light, the script and the journey both unfold in unexpected ways. I make it a point to emphasize to all students—new and returning—how important it is to be willing to go down the unexpected path when opportunities arise—even if it leads to what one might perceive as failure. It’s important—necessary—to move toward the uncertainty, rather than demand what we expected, to follow the script that we believe was written for us—even if, in truth, that’s not how the script goes. Because there is no script.